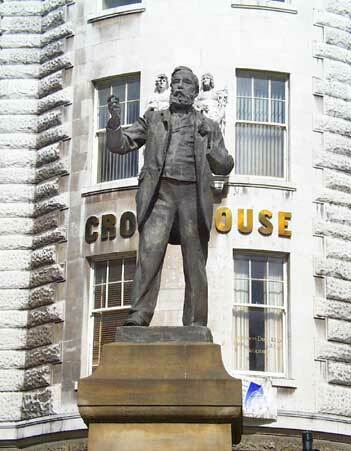 The statue of Joseph Cowen, situated at the junction of Westgate Road and Fenkle Street. Location: Westgate Road/Fenkle Street, Newcastle. Materials: Sandstone Ashlar and Bronze. Status: Listed Grade II. A heroic size bronze statue standing upon a curved pedestal inscribed " Joseph Cowen 1829 - 1900. Erected by Public Subscription 1906." Joseph Cowen, the elder, made his money manufacturing bricks and clay products in the Blaydon Burn, Gateshead, was a leading advocate of parliamentary reform and of the repeal of the Corn Laws and became Member of Parliament for Newcastle in the 1860's. His son, the subject of the statue, carried on the liberal family tradition and also became Member of Parliament for the City. In 1862 he bought the Newcastle Chronicle and in 1880 opened the then new public library. Middlebrook in his history "Newcastle upon Tyne; Its Growth and Achievements" reports that Cowen was also the first borrower - "the book he took out, Mill's essay "On Liberty" being as characteristic of the age as of the man." Cowen was an MP from 1873 to 1886. He was also responsible for the founding of the Tyne Theatre and Opera House which opened in 1867 in Westgate Road.